American artist Tauba Auerbach’s new ICA show, titled The New Ambidextrous Universe, is an accessible exploration of a decidedly complex theme, namely the concept of four-dimensional space. In attempting to create art that allows us to imagine a visual universe beyond three dimensions, Auerbach offers up pieces like The New Ambidextrous Universe IV, a plywood and aluminium sculpture that looks like a piece of flooring after undergoing a sci-fi reality warp. 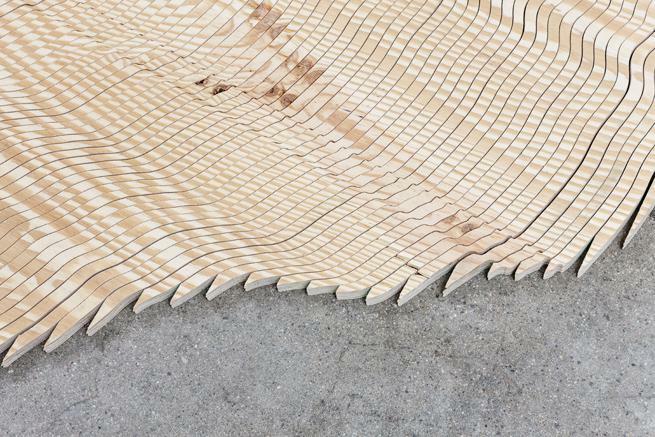 The surface has been dissected into long, parallel strips in an irregular wave pattern, with the grain of the wood blending into a new structure that seems to have been constructed according to the rules of some sort of other-wordly physics. This elegant work serves as a gentle introduction to the concept of mysterious dimensions beyond those we can normally see. Prism Scan II (Cross Polarized Mesosiderite) (2014) takes the sense of inscrutability up a notch, this time in a 2D photographic print of rippling light, colours and forms, as indecipherable as reflections on the surface of dark, choppy water. Unlike The New Ambidextrous Universe IV, which remains a recognizable, albeit warped, version of earthly materials, the base material of Prism Scan II has been abstracted to create a shadowy, undulating composition, vaguely suggestive of a cityscape at the outer reaches of our visual perception. More unfathomable still is S Helix (2014), a sculpture that plays with light and colour to powerful effect. The insipid, artificial orange of the artwork’s base is refracted up through the angular, geometric glass tube on its surface, creating the imaginary impression that the sculpture is luminescent. The tube itself is mirrored imperfectly on the glossy surface of the base, making an infinite loop of reflected and refracted colour and light. From every angle the sculpture appears different, with shadows from the gallery and natural light from the windows contributing to the effect of an artwork that constantly leads the eye in new directions, forcing the viewer to consider the piece as something greater than a 3D object made of glass, metal and paint. For all the complex science at play in this show, Auerbach’s art remains approachable and directly engaging, working on the level of our instinctive reactions to physical objects and visual tricks. Knit Stitch (2014) is a steel and powder-coated sculpture made in bright primary colours, a magnified version of a knit stitch that defamiliarises a simple, everyday structure and allows us to muse on how little consideration we give to the true physical make-up of our complex, multi-dimensional universe. The New Ambidextrous Universe may not quite allow us to perceive the fourth dimension, but it certainly serves as a reminder that there is more going on in the physical world than meets the eye. Tauba Auerbach’s The New Ambidextrous Universe is open at the ICA until 15 June.